“Each film presents its own challenges, but also its own opportunities,” says Zachary Sluser, who would know. No other film at the Tribeca Film Festival was more likely to confound or delight, with little space in between, than Sluser’s adaptation of Tom Drury’s “The Driftless Area,” a meditation on fate and those who dare attempt to control it. While it’s set in the quiet, geologically wondrous Midwestern region alluded to in the film’s title, the film is far more expansive in scope, covering a multitude of genres as it follows the fight over a bag full of cash from the clutches of a hardened criminal (John Hawkes) as it falls into the hands of a contemplative young barkeep (Anton Yelchin) who is infatuated with a survivor of an arson fire (Zooey Deschanel), much to the chagrin of his friend Carrie (Alia Shawkat). Told in a fragmented style where its power accumulates gradually over time, Sluser dips into noir, romance, dark comedy and even a little science fiction, as it works metaphysics into the mix, during the course of “The Driftless Area,” creating a mystique that only can exist in cinema to illuminate and ultimately pull together the shards of humanity that still exist amongst the broken souls that find themselves in stasis, ebbing away slowly like the glaciers surrounding them. It’s ambitious stuff for a first-time director, but Sluser wisely allowed himself an early run at Drury’s barbed and yet clear-eyed, elegiac prose with an adaptation of his New Yorker short story “Path Lights,” which pays major dividends here. Shortly after the film premiered at the Tribeca Film Festival, Sluser spoke about how he first became interested in Drury’s writing and how they worked together to bring his work to the big screen, as well as the film’s visual influences and his personal connection to the material. Before even getting to “The Driftless Area,” how did you initially get interested in the work of Tom Drury? I actually found Tom Drury’s first novel called “The End of Vandalism” after it was recommended to me at this wonderful bookstore called Prairie Lights in Iowa City. I live in LA now, but I grew up in Fairfield, Iowa and was visiting back home. I was immediately drawn to the spare, humorous, and touching prose, so when he had a new book, “The Driftless Area,” I read that next and was so taken with it, the way it approached time and fate, and how we struggle with trying to control our destinies and the afterlife and our death. It has a completely matter-of-fact and humorous tone that I just loved it, so I reached out to him. We actually started adapting “Driftless” first. As we started working on the script, he shared with me one of his New Yorker short stories, which was “Path Lights.” I made a few short films and thought this would be a great opportunity to show what Tom and I could do together, so I adapted that. Then a friend introduced me to John Hawkes and he became the lead in the short. I already had designs on him for “Driftless,” to play Shane. We enjoyed working together so much in the short film that he quickly became our champion for making the feature. Tonally, did making the short prove useful in how to adapt Tom’s work to the screen? Yeah. It’s a very different story, but it taught me a lot about gaining Tom’s trust, and learning that Tom is a very generous and open writer in [terms of allowing] his work to become new and different when it makes its way to the screen. He’s constantly revising his written work, but once it’s out’s there, it’s done in his eyes and it’s there to be read. If it’s going to be translated into a new medium, then he’s very open to best suit that medium. I also learned a lot from John in how best to work with him and what is helpful to him as an actor. It was interesting to hear Tom say at the premiere that he felt like he was starting from scratch in terms of adaptation while you said you had learned to protect what was great about this novel. Did you feel like those were opposing viewpoints? I don’t want to speak for him, but I think what he’s saying is, “Let’s see what this could become.” That’s where he started. Where I started was, “I love this book so much. I want to create this world. I want to explore these themes and these people.” As we moved along the path of adaptation, when it was time to lose the theme in writing, or even in editing, Tom really helped me keep my eyes open and not be worried about protecting the writing at the expense of the film. He was just a great partner that never let me feel that if something was different, then it was wrong. Different could be equally good, or even better, so they weren’t really competing [viewpoints] so much as learning how to work together, and learning that I could make changes and Tom would be excited by them. Was there something you could latch onto to unlock this story? I got a lot of inspiration from where the movie is set, this unique region to the Midwest [known as] the Driftless Area. I grew up in the Midwest, so my experience was very flat, but the Driftless Area, which I have now visited a bunch, has these beautiful rolling hills and highlands because the glaciers moved around it and left it untouched. As you see in the movie, those rock formations are wild and strange, and beautiful, and mysterious, this ancient, timeless land that’s a perfect backdrop, indifferent to the very temporal struggles of the people that are trying to control their fate. That was inspiring to me in terms of how the camera connects to the actors on screen. My [director of photography] Daniel Voldheim really wanted a more objective, observant, and still camera than one that’s constantly zipping around and pushing in quickly, which was inspired by the patient indifference of the land itself. Is it true your influences in general for this were still photographers rather than other films? We watched other films, too [where we’d talk] about the lighting and the camera movement, and the blocking that we like. But when Daniel and I met, we learned right away we shared a love for the work of Todd Hido, the photographer. That immediately got us on the same page in terms of finding the extraordinary in the ordinary and stylization in the natural. His photography does that. Very atmospheric, and he has a very grounded approach, so we were going for that. Were the metaphysical aspects of this something that was tricky to get your head around? I read that Anton had learned bar tending for this. Were you giving the actors things to do or to think about in preparation for this? Anton went across the street from our hotel where we were staying, and they let him learn to bar tend, which was wonderful. But I wouldn’t give them specific, mysterious games. Mainly, it was just about constantly communicating with each other and making sure we’re telling the same story, and helping each other ask the right questions. I’d have conversations to get to know them and see their own personal approach to some of the themes and the ideas in the script — how they think their character feels about fate and destiny and their understanding of each individual scene. Since this was your first feature, was directing a feature any different than anything you’ve done before? Yes, completely, and no, not at all. On a short film, you’re shooting for three or four days. You prepare in the same way. You work with your collaborators the same way. But a [feature] film keeps coming at you and presenting new challenges. It just reinforces what I learned on shorts, which is that every collaborator and every role is really important. Your producer needs to believe in the way you’re telling the film and the film itself in order to support you in the production, the editing and the development. The only difference [between shorts and features] is that there’s more opportunities. The challenge is to create more opportunity in a feature. That makes choosing the right actors, crew members to collaborate with critical. It was a blast. It was incredibly rewarding to have such a warm reception from the audience. Everyone at Tribeca has been so kind and supportive of our film. We’ve been so, so lucky and excited to premiere here in New York. 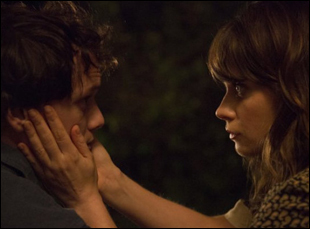 “The Driftless Area” does not yet have U.S. distribution. Newport Beach Film Fest '15 Interview: Nick Wernham on "No Stranger Than Love"
Interview: Maxime Giroux on Making a Connection with "Felix and Meira"